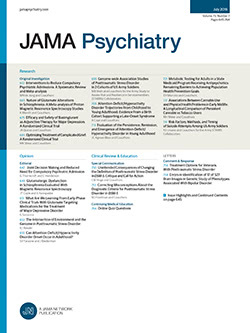 Mission Statement: JAMA Psychiatry strives to publish original, state-of-the-art studies and commentaries of general interest to clinicians, scholars, and research scientists in psychiatry, mental health, behavioral science, and allied fields. The journal seeks to inform and to educate its readers as well as to stimulate debate and further exploration into the nature, causes, treatment, and public health importance of mental illness. The JAMA Network is a consortium of peer-reviewed print and online medical publications that includes JAMA, JAMA Psychiatry, and other specialty journals. All articles published, including editorials, letters, and book reviews, represent the opinions of the authors and do not reflect the policy of the American Medical Association, the Editorial Board, or the institution with which the author is affiliated, unless this is clearly specified. © 2013 American Medical Association. All rights reserved. Reproduction without permission is prohibited.